"Only those who wonder, find a new path." We are planning one short hiking exploration adventure on Saturday, Jan. 26th. 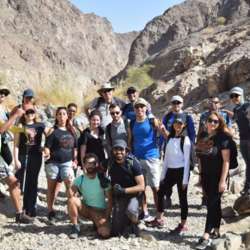 afternoon to explore Wadi Shawka Pools area. 20:00 Drive back to Dubai. ✔ Hat, Sunglasses 😎 & sun screen. ✔ Power Banks for the mob. ✔ Torch & led lights. ✔ Mat or beach chair. 4*4 cars are preferable but not a must.